Black holes are tremendous objects whose immense gravity can distort and twist space-time, the fabric that shapes our universe. These effects, consequences of Einstein's general theory of relativity, result in the bending of light as it travels through space-time. 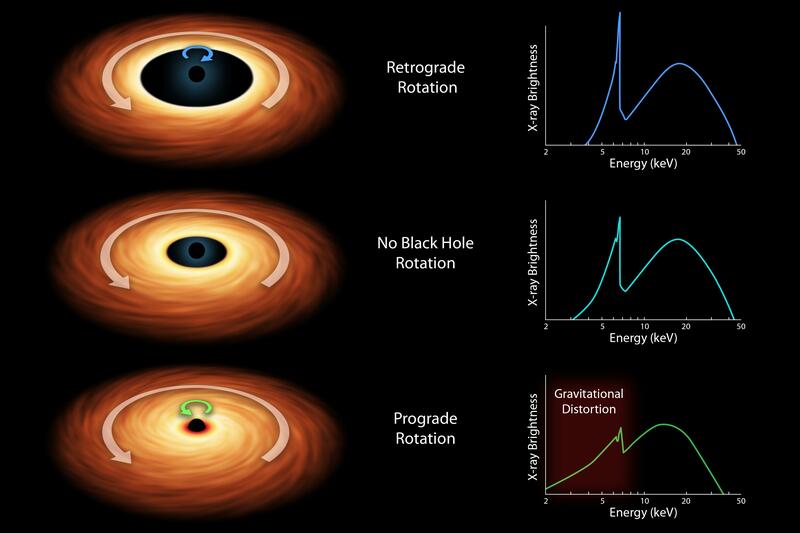 By looking for these light distortions in X-rays streaming off material near black holes, researchers can gain information about their spin rates. 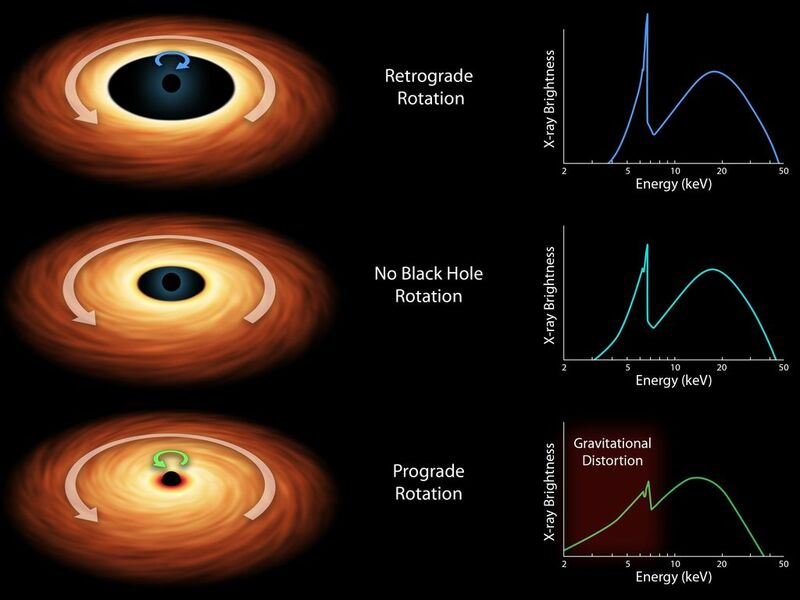 The faster a black hole spins, the closer its accretion disk can lie to it -- another consequence of Einstein's theory of relativity. 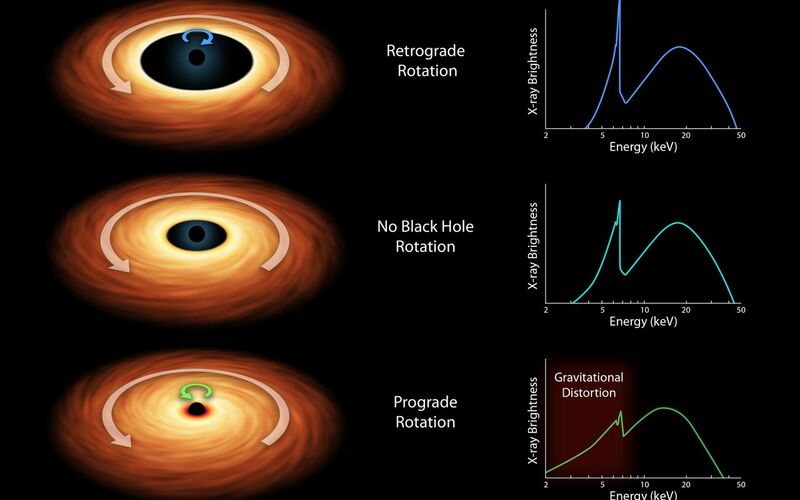 Scientists assess how close the inner edge of an accretion disk comes to a black hole by breaking the X-ray light up into a spectrum of different colors, or energies. The resulting spectra for the three spin scenarios are shown at right. The sharp peak is X-ray radiation from iron atoms circulating in the accretion disk. 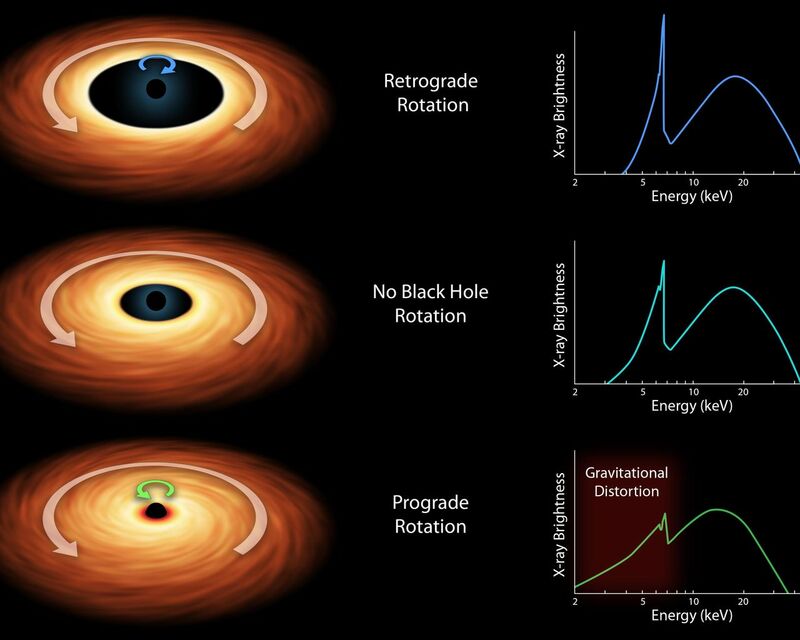 If the accretion disk is close to the black hole, as is the case in the final row, the X-ray colors from the iron will be spread out by the immense gravity of the black hole. The degree to which the iron feature is spread out, a phenomenon referred to as the "red wing," reveals how close the accretion disk is to the black hole. Because this distance depends on the black hole's spin, the spin rate can then be determined. Prior to observations with NASA's Nuclear Spectroscopic Telescope Array (NuSTAR), which captures X-ray radiation with energy from the 3 to 79 kiloelectron volt (keV) range, this model remained uncertain. Together with the European Space Agency's XMM-Newton telescope, which sees X-ray light in the 0.1 to 10 keV range, the observatories were able to show that the model is correct. Their data ruled out the possibility that the iron feature only appears to be distorted as a result of intervening absorbing clouds, and not gravitational effects. For more information, visit http://www.nasa.gov/nustar and http://www.nustar.caltech.edu/. For more information on ESA's XMM-Newton mission, visit http://go.nasa.gov/YUYpI6.